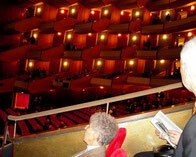 Opera house of Hamburg - guide-sud-france jimdo page! Hamburg, like most German cities, lost its opera house to bombs during the war but the stage somehow survived and the starkly modern new opera house was built around it, opening in 1955 with 1,675 seats in a radical design, featuring balconies subdivided so that each seat is close to and facing the stage. There is not a bad seat in the house. The season runs from the end of August until early June with the best chance for getting tickets to nonsubscription, contemporary operas. The box office is open weekdays from 10 a.m. - 2 p.m. and 4-6:30 p.m., Saturday from 10 a.m. - 2 p.m. and 90 minutes before each performance. Tickets go on sale two weeks before the performance or can be ordered in advance by writing to the box office or on-line.